Like the luminous purple glow from a black light bulb, this vivacious violet shade will make typically plain letters and packages pop with personality. Yet these return address labels are also a professional finishing touch that gives your outgoing mail a polished appearance. You've been scribbling chicken scratch on envelopes for long enough. It's time to make a change! Choose these convenient, self-adhesive labels, and all you'll ever have to do is peel and place your name and address on anything that goes in the mailbox. 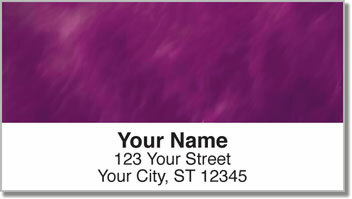 Order your very own Purple Light Wave Address Labels today! This selection is also available in other color options. Plus, don't forget to take a peek at the matching personal check designs.